AEGEE is one of the largest student organizations in Europe and it has numerous local groups (aka antennae), and luckily one of them is in my town, Santander. A few months ago I decided to join this organization attracted by one of its killer activities, the so-called Summer Universities. These Summer Universities, SU for shortness, are organized by each local antennae every summer and they consist of a program of different activities spread along two weeks and ranging from language courses to hiking routes for instance. In my case I have been very lucky: this year, first fortnight of September, I will go to the "Inspiring SU", organized by AEGEE-Warszawa. "It will take place in wildest mountains in central Europe, in place where wolves still are running in woods. This place is called Bieszczady Mountains. You won't find here any SPA hotels or 5 stars restaurants. Only students who are seeking for a real adventure!" Apart from a few local activities, like the weekly AEGEE meetings and parties, I hadn't participated in any cross-antennae AEGEE activity until a few weeks ago when I went to a meeting with Madrid's antennae. My friend Jorge, which is also the president of AEGEE-Santander and was my partner during my studies on Telecommunications Engineering, took me and another girl to Madrid by car. The first day, I was on my own because Jorge and others were going to go to a music festival and they already had somewhere to sleep. 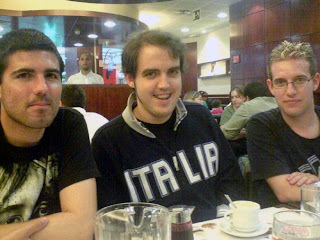 Fortunately, I could contact with two of my friends who are living and working in Madrid, Gonzalo and Andrés (thank you very much to both of them!!). After walking the streets of Madrid for a while, I met Andrés and he took me to a very nice restaurant in the Real Madrid's stadium, Santiago Bernabeu. We had a great talk there and then we went to have a drink and meet my other friend Gonzalo, who was having dinner with his girlfriend and girlfriend's sister. We all went together to chat in a cafe at Malasaña, an area of Madrid which seems to have a lot of bars. After that, I spent the night in Gonzalo's home where we were watching a horrible movie "Almost 300" until late at night hahaha!! In the morning, Gonzalo gave me a great breakfast and accompanied me until Andrés came. Then, it was time to meet the first persons from AEGEE-Madrid, Coral and Pilar, in Mostoles. They were very nice and I got the impression that they were used to meet new people all the time. That's one of the good points of this organization. After the presentations, we went to a big commercial center called Xanadú which had lots of shops, restaurants, and even KARTS and a HUGE artificial skii resort!! At night, there was a dinner with the rest of AEGEE-Madrid people which was very funny and noisy. Lots of jokes, songs, laughter.. Then we all went to party until very late. Actually, Andrés and me went back to his home at 9 am in the morning after being walking for a while so he could recover from the alcohol XD.